Summer vacation will be over before we know it (moment of silence please) and our memories will be stored in our hearts, on video, and in xsome great photos. This week for Lil Sprouts Book Club I thought it would be a great opportunity to have your children make a book of their own. This is an excellent for a time of reflection at home as the summer days wind to a close, or during the first week of school. Have children collect pictures or post cards of a trip, activity, or event that they participated in this summer. We visited the Georgia Aquarium in Atlanta while passing through, and my son picked out several postcards that he liked. Its been weeks since our trip, and as I pulled them out today he was still able to name the animals and talk to me about them. 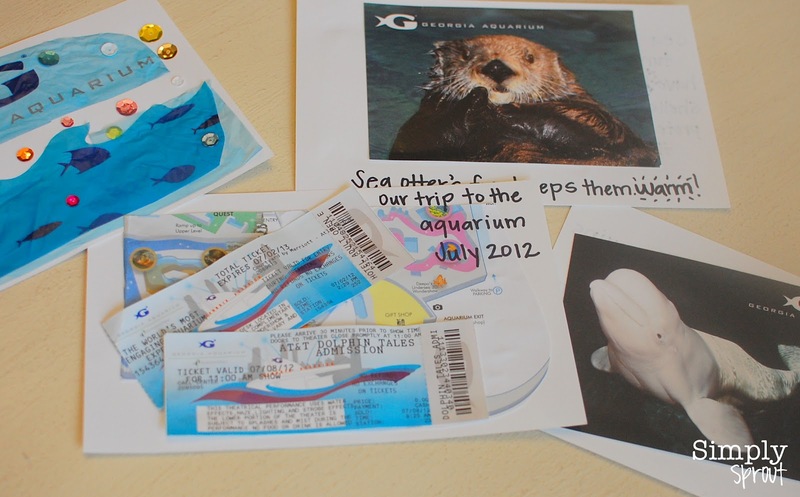 I decided that these post cards would make the perfect little book about his time at the aquarium. A vacation book has no rules. You can encourage children to write or tell you about the things they saw, heard, touched, or felt while visiting. You could have them make a fictitious story with the pictures they've assembled. Or they could even choose to make it a book of facts about things that they've learned. Using some white card stock paper, the map, ticket stubs, a gift shop bag, and of course the post cards we were ready to make a one of a kind book! I cut the gift store bag down and glued it to the cover. 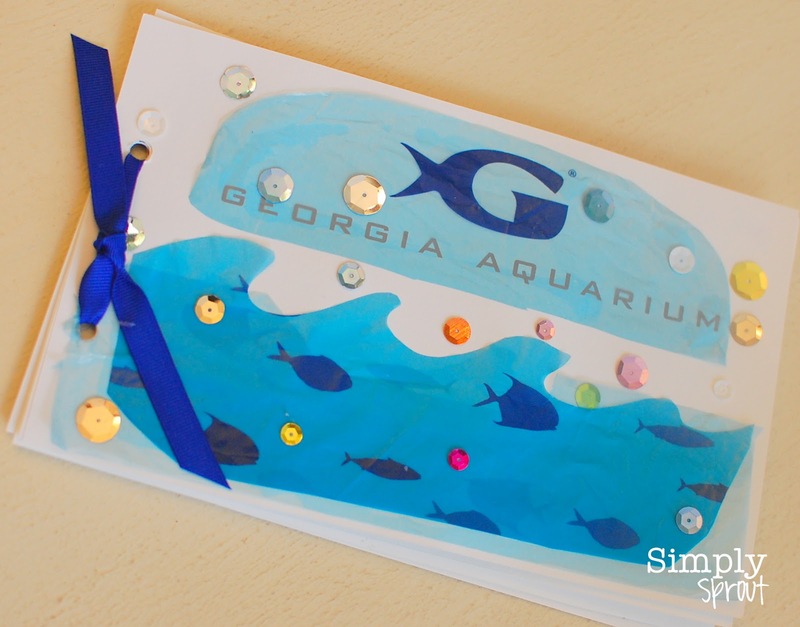 I had my son pick out sequins and place them on the dots of glue that I placed on the cover (great fine motor skill practice). Then we talked a little more about the animals, and I wrote simple sentences to correlate to each post card. I hole punched and tied it up with some ribbon, and it was snatched up quickly by the little reader in the house! He was quite proud of his sequin work! 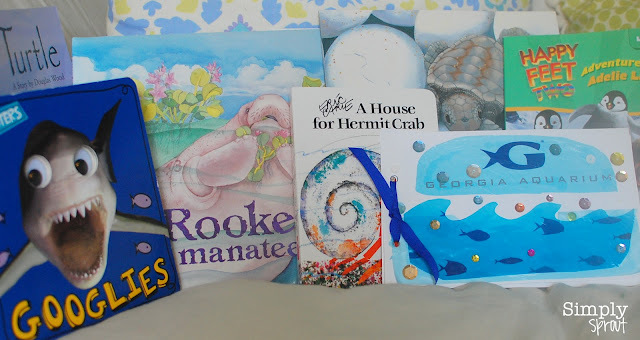 It's one of many ocean related books found in the reading nook of our house, but the only one made especially for him! What a great way to showcase special times in your child's life. I can't wait to have my students make summer books of their own when they come back to school. What an amazing summer book library we'll have!